ALL WARNINGS AND WATHCES HAVE BEEN LIFTED. Roads to reopen today Nacimiento Fergusson Road, South Coast Ridge Road and Willow Creek Road south to Highway 1 will reopen on Monday, October 27, 2008 at 12 Noon. Update: 10-27 1800hrs - Chalk (CA-LPF-2754) 16,269 Acres and 98% contained. Mark Nunez (ICT3) assumed command of the fire this morning. Rolling rocks and debris on Highway 1 south of The Hermitage Road remain a problem. All road closures have been removed today at 1200 hours, except for Cone Peak Road which will remain closed until further notice per the Monterey District Office. Road Closures: Please exercise caution when traveling on Highway 1 along Twitchell Flats and Limekiln State Park. Due to rolling rocks and debris from the burned hillsides along this area, expect delays from 15 to 20 minutes. Electronic message boards are located at Highway 101 and 46, Highway 46 and Highway 1, Hearst Castle, north of Willow Creek Bridge, Nepenthe in Big Sur and Rio Road and Highway 1 in Carmel. Roads to reopen today: Nacimiento Fergusson Road, South Coast Ridge Road and Willow Creek Road south to Highway 1 will reopen on Monday, October 27, 2008 at 12Noon. Fuels Involved - 4 Chaparral (6 Feet) Large volume of dead and down material in fire fuel bed from sudden oak death and previous fires. Oak woodland and pockets of timber. Significant Events - Rock and debris fall continues on Highway 1 resulting in periodic closures. Drivers are strongly advised to heed Caltrans caution/closure signs or risk damage to their vehicles. Electronic message boards are at the following locations: 101 and Highway 46, Highway 1 and 46, Hearst Castle, north of Willow Creek Bridge, Nepenthe in Big Sur and Rio Road and Highway 1 in Carmel. 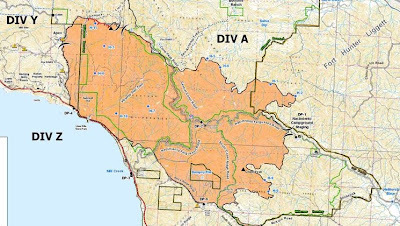 The Central Coast Interagency Incident Management Team 7 will be transitioning to the local Type 3 team beginning tomorrow morning, October 26, 2008 at 6:00 am. Incident Commander will be Mark Nunez. Outlook and Planned Actions - Crews continue to mop up and improve existing line along the Hermitage Road to Highway 1. They will also continue to mop up around structures and improvements in Limekiln State Park. Crews continue to clean up and remove hose. The Evacuation Watch for Hermitage has been lifted as of 6:00pm Saturday, Oct.25, 2008. The Evacuation Watch for the Harlan Ranch and Morning Glory area was lifted as of 6:00pm on October 23, 2008. Remarks - Crews monitored and extinguished hot spots found in the Twin Peaks area and along the coast near the Limekiln State Park area. Rehab work continued on the dozer line above the Hermitage and removal of fire hose and trash will continue today. Please exercise caution when traveling on Highway 1 along Twitchell Flats and Limekiln State Park. Due to rolling rocks and debris from the burned hillsides along this area, expect delays from 15 to 20 minutes. Electronic message boards are located at Highway 101 and 46, Highway 46 and Highway 1, Hearst Castle, north of Willow Creek Bridge, Nepenthe in Big Sur and Rio Road and Highway 1 in Carmel. Nacimiento Fergusson Road, South Coast Ridge Road and Willow Creek Road south to Highway 1 will reopen on Monday, October 27, 2008 at 12Noon.